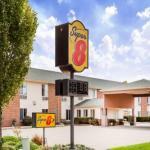 A free breakfast is something to look forward to at Super 8 Pekin where there's also an indoor pool. The two-story 43-room hotel offers guests free movie channels on the cable TV. Enjoy a snack while you watch â?? with an in-room microwave and mini-fridge fixing and storing goodies is a snap. You can sprawl out in the indoor heated pool for a float no matter what the weather. Brew your own fresh coffee in-room before heading to the daily free breakfast where you'll find assorted baked goods and morning beverages. The hotel is off of Route 9 across from a shopping mall and a megastore. There are a number of restaurants within easy walking distance including local spots fast food national chains and gourmet coffee houses. Get some fresh air at Mineral Springs Park three miles away near the city center for a water park woods and scenic walking trails. Drive 11 miles to Par-A-Dice Riverboat Casino to try your luck or learn about automotive history at Wheels o' Time Museum 22 miles away. It's 14 miles to Peoria International Airport.